There’s been a ton of Star Wars news this week, and we can hardly contain our excitement. Not only is there a brand new Rogue One trailer, but there’s also also news about the next Star Wars movie. No, not Episode VII. The next next Star Wars movie, The Young Han Solo Story. 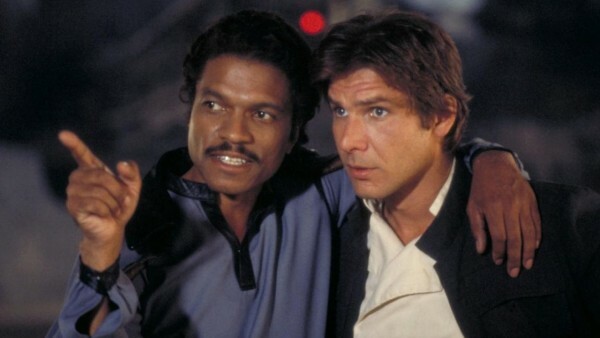 When news that the movie would focus on not just Han, but also Chewbacca, our next thought was: Can Lando come along, too? Right now, it looks like that’s going to happen. A young, dashing Lando Calrissian will also be front-and-center in this new Star Wars spin-off (Billy Dee Williams, never forget, you’ll always be our forever 80’s crush). But that’s not the only big news about the Han Solo movie. Casting Lando is is only just the beginning, and just might be our ticket to PROGRESS. We’re talking true diversity in casting, and in a Star Wars movie. Rumor has it that Lucasfilm is currently in the process of trying to cast a female lead for the Han Solo movie, but not just any female lead, but a woman of color. OMG, yes. Though not confirmed whatsoever, it’s thought that this role would actually be Sana Starros, from the Star Wars comics, another scoundrel just like Han (who once posed as his wife for a job once, and then everyone freaked out thinking about Han being married, pre-Leia). This WOC lead will join Alden Ehrenreich, who’s already been cast as the our new, young Han Solo. She’ll also join young Chewbacca. And young Lando!! We like where this Han Solo movie is heading. And add in the diversity aspect, and we are stoked. We can probably thank the progressive casting of Star Wars: The Force Awakens for this. Because, though the comic books have been envisioning diversity in the Star Wars universe for years now, we all know the film industry is slow to such change. The Force Awakens showed us that a female and a black male hero can not just carry a show, but win at the box office.